Polyvance’s cordless, rechargeable 6204 Hot Spot Plastic Stapler defines plastic reinforcement simplicity. 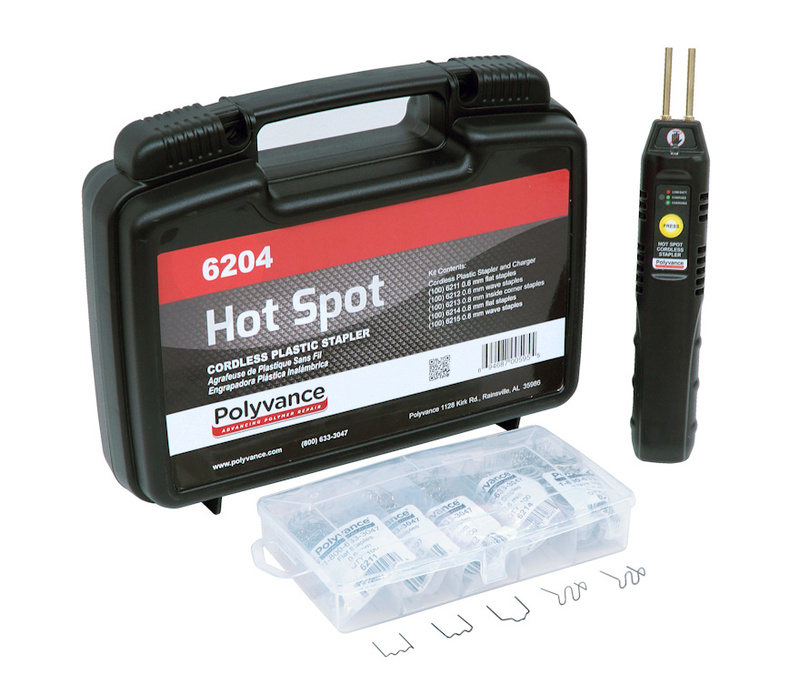 Reinforcing plastics with the 6204 Hot Spot is quick, strong, and cost effective. The Hot Spot Stapler is perfect for holding broken tabs in position while making weld repairs. With our wide variety of specialty staples, you will be able to strengthen virtually any type of thermoplastic repair, from inside and outside corners to narrow mounting tabs. To operate, simply insert a staple into the brass contacts then press the button. While holding the button, press the hot staple into the plastic to reinforce the damaged area. Release the button and gently twist the staple a few degrees. Hold for a few seconds letting the plastic harden, then pull the stapler away, leaving the staple in place. Cut off the exposed wire with diagonal cutters and sand smooth.